The funicular railway operated from 1 May 1992 to 4th October 1992. 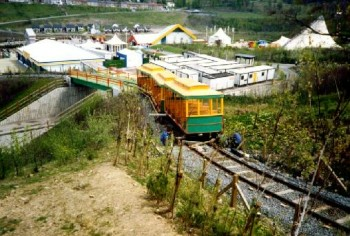 The railway connected the lower part of the festival site with a hill farm appropriately set at the top of a steep hill. The line was 920metres long, single track with a central passing loop. The vertical rise was 72 metres at an average incline of 1 in 11, the steepest section being 1 in 5. Track gauge was 3�6�. The funicular was built by WGH Transportation Engineering of Old Edlington near Doncaster at a cost of approximately �700,000. The two trains each consisted of three cars with a total passenger capacity of 92 per train. 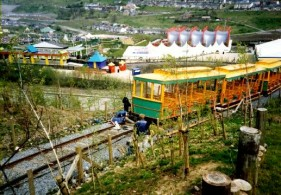 The unmanned winding house was situated below the lower station and control of the system rested with the driver of the downhill car. On 8th June the descending train derailed on the bottom curve as shown on the accompanying photographs. Additional safety features were added before the service resumed on the 28th June. It is believed that the funicular was scrapped after the closure of the Festival following unsuccessful attempts to sell it for �200,000. (The above is an abbreviated version of a full description available at http://www.hows.org.uk/personal/rail/ngf.htm and appears with the permission of the owner, Dr Mark Hows. The site also details other funicular, cable and other unusual railways throughout Great Britain and is well worth a visit). Photographs copyright of Glyn Bowen.